Lucketts has a range of vehicles suitable for passengers with disabilities, however its important that we we know about your requirements at the time of booking to ensure that your needs are met at each stage of the journey. If you or any of your party will need assistance getting on or off a coach, please contact us . Our drivers and escorts are not permitted to lift or carry passengers on and off coaches, or take any other action that may put their own health, safety and welfare at risk. Our drivers are happy to assist with the loading and unloading of luggage from the coach, but will need assistance with items over 20kgs. Subject to our vehicles loading capacity, we can sometimes transport lightweight, manual wheelchairs, provided they are able to be stowed in the luggage hold of the coach. We regret that we are unable to accept manual wheelchairs that are more than 20kgs. Please let us know at the time of booking if you wish to travel with a wheelchair. We must be notified of your requirements at least one week prior to departure. If the disabled passenger needs to travel in their wheelchair in the main cabin of the coach we have vehicles that can accommodate this, providing the wheelchair fits within the dimensions below. 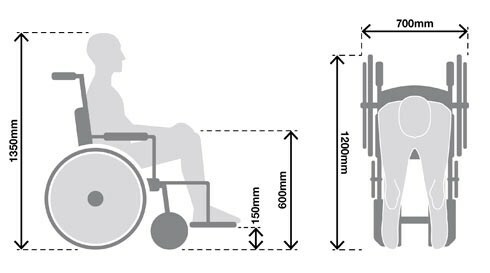 If the wheelchair exceeds the dimensions or we are unable to restrain the chair safely, the passenger will be unable to travel in this way. That we have sufficient additional room in the hold to carry the item. If the assistance dog is unable to lie at the passenger's feet an additional charge will apply. Aisles are not to be blocked for safety reasons. Provide medical services such as giving injections. If a medical condition requires others to provide this type of care, the passenger should travel with a companion who can assist them during the journey. Lucketts Travel will not accept liability for any damage to personal property howsoever caused.